Not to be confused with Flemish Brabant, Walloon Brabant, or North Brabant. For other uses, see Brabant (disambiguation). After the defeat of Napoleon in 1815, the United Kingdom of the Netherlands was created at the Congress of Vienna, consisting of territories which had been added to France by Napoleon: the former Dutch Republic and the Southern Netherlands. In the newly created kingdom, the former French département Dyle became the new province of South Brabant, distinguishing it from Central Brabant (later Antwerp province); and from North Brabant (now part of the Netherlands), all named after the former Duchy of Brabant. 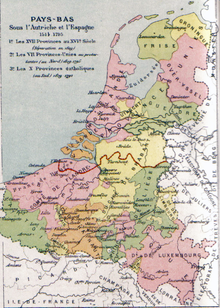 After the Belgian Revolution of 1830, the Southern Netherlands (including South and Central Brabant) became independent as Belgium and later also Luxembourg. The province was then renamed simply Brabant and became the central province of Belgium, with its capital city Brussels. The province contained three arrondissements: Brussels, Leuven and Nivelles. In 1961–1963 the language border was established, from which the province was divided into a Dutch-speaking region, a French-speaking region and the bilingual Brussels. The Brussels arrondissement was split to this end. In 1989, Brussels-Capital Region was created, but the region was still part of the province of Brabant. In 1995, the province of Brabant was split into the Dutch-speaking Flemish Brabant, the French-speaking Walloon Brabant and the bilingual Brussels-Capital Region. The Brussels-Capital Region exercises the powers of a Province on its own territory. As comparison, the current two provinces of Brabant, together with Brussels, had 2,621,275 inhabitants in January 2011. ^ Chisholm, Hugh, ed. (1911). "Brabant (province)" . Encyclopædia Britannica (11th ed.). Cambridge University Press.